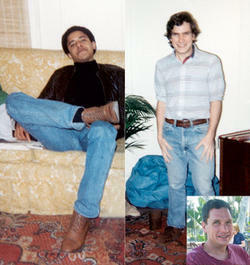 Obama and Boerner snapped photos of each other when they were roommates on West 109th Street. Inset: Boerner today. PHOTOS: Obama and boerner in apartment, courtesy Phil Boerner ’84; boerner today: Pern Beckman ’84I was Barack Obama ’83’s roommate at Columbia College in fall 1981. I met him in 1979, when we were freshmen at Occidental College (Oxy) in Los Angeles and our dorm rooms were directly opposite each other. I came to college as a middle-class guy from Bethesda, Md., where I’d lived from fifth grade through high school. At Oxy, we attended some of the same social events and had late-night philosophical discussions related to our college reading or to current affairs. We attended rallies on campus where we were urged to “draft beer, not people,” and discussed the Soviet invasion of Afghanistan, apartheid in South Africa, the hostages in Iran and the Contras in Latin America. The crowd we hung out with included men, women, blacks, whites, Hispanics and international students. Barack listened carefully to all points of view and he was funny, smart, thoughtful and well-liked. It was easy to sit down with him and have a fun conversation. We both transferred from Oxy to Columbia in fall 1981. Barack had found an apartment on West 109th Street, between Amsterdam and Columbus, and suggested that I room with him. Our sublet was a third-story walk-up in a so-so neighborhood; the unit next door was burned out and vacant. The doorbell didn’t work; to be let in when I first arrived I had to yell up to Barack from the street. It was a railroad apartment: From the kitchen, you walked into Barack’s room, then my room, and lastly the living room. We didn’t have a television or computers. In that apartment we hosted a number of visitors, mostly friends from Oxy who stayed overnight when they were passing through town. Barack was very generous to these visitors. As a host and roommate, he sometimes did the shopping and cooked the chicken curry. Barack has said that he spent a lot of time in the library while at Columbia and one reason for this was that our apartment had irregular heat, and we didn’t enjoy hanging out there once the weather got cold. The radiators in our apartment were either stone cold, or, less often, blasted out such intense heat that we had to open the windows and let in freezing air just to cool things down. When the heat wasn’t on, we sometimes sat with sleeping bags or blankets wrapped around ourselves and read our school books. We also didn’t have regular hot water and sometimes used the Columbia gym for showers. I remember often eating breakfast with Barack at Tom’s Restaurant on Broadway. Occasionally we went to The West End for beers. We enjoyed exploring museums such as the Guggenheim, the Met and the American Museum of Natural History, and browsing in bookstores such as the Strand and the Barnes & Noble opposite Columbia. We both liked taking long walks down Broadway on a Sunday afternoon, and listening to the silence of Central Park after a big snow. I also remember jogging the loop around Central Park with Barack. One weekend I invited Barack to meet my grandparents, Elizabeth and William Lytton Payne ’46 GSAS, at their summer place in the Catskills, which we called “the farm.” I took Barack to meet some neighbors on the mountain; everyone seemed to like him pretty well, whether they were die-hard supporters of Ronald Reagan or extreme liberals. While at the farm, Barack joined the routines there, which typically included a few morning hours doing chores, such as clearing brush and sawing firewood. After that first semester, we had to move. Barack tried to find an apartment for both of us, but was only able to find a studio for himself. I was able to house-sit in Brooklyn Heights. Barack and other friends came and visited me there a few times; we typically watched pro basketball or football on TV, or went out for dinner at a Chinese restaurant. He was amused by my beginning banjo playing (I’m much better today!). Hanging out, we could get pretty emotional about sports, food and injustice. I remember one time when we were out walking he took the time to ask a homeless guy how he was doing, so even then he was concerned about others. Through different living arrangements in Astoria, Queens; Bay Ridge, Brooklyn; and all over Manhattan, we stayed in touch and remained friends for the rest of our college years. He got to know my girlfriend from Arkansas, who is now my wife. Since I last saw him in 1985, we have exchanged a few letters and photos. He left for Chicago, and I eventually settled in Sacramento. Barack wasn’t thinking about becoming President when he was in college; he wanted to be a writer. Barack is a good man — some might even call him a saint for tolerating my beginning banjo playing. Based on my six years of knowing him in college and the years immediately after, I can vouch that Barack is a man of character, and I trust him to do the right things when he is President. Phil Boerner ’84 was born in Washington, D.C., and lives with his wife and two children in Sacramento, Calif. He is communications and public relations manager at the California Veterinary Medical Association.